Mr Fogg's exclusive Gifts are now available to purchase securely online. 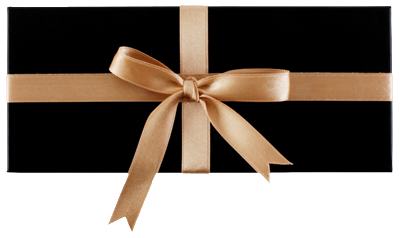 Gifts can be personalised with a message and sent instantly by eMail, SMS Text or 1st Class Post. Calling all intrepid adventurers, curious minds, and those with a penchant for the eccentric. 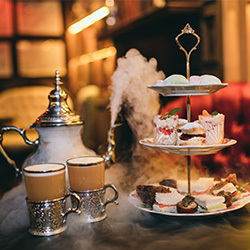 Immerse yourselves in the weird and wonderful world of Mr. Fogg’s Society of Exploration with Cream Cakes and Cocktails for Two.Take your seats amongst a madcap collection of eclectic artefacts, collected from far-flung corners of the world, and get ready to dine in style. 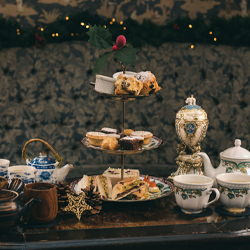 You’ll enjoy a decadent selection of cream cakes alongside an exquisite Mr. Fogg’s cocktail created by one of Fogg’s adventurous mixologists. Indulge your sweet tooth and your spirit lust in unforgettable surroundings. Calling all intrepid spirit enthusiasts! Every Tuesday from 7pm, embark on a merry journey across the globe in Mr Fogg’s Spirited Journey. Kick-start your evening with a G&T before sampling four tasters of spirits from four different continents. 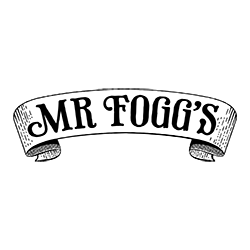 Enjoy one and a half hours of historical tuition on the origins of alcohol and how each continent spent centuries perfecting what is now their regional tipple. "Mr Fogg’s Gin Parlour’s Gin Safari experience is ready to set sail every Monday & Tuesday from 7pm. Enjoy a welcome G&T, followed by four gin tasters as you and your fellow hunters enjoy one and a half hours of expert tuition – covering gin, botanicals and tonics – and become masters of mother’s ruin. 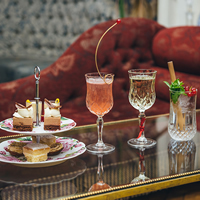 Then, have the chance to hand pick a gin of your choice from The Gin Room – where Mr Fogg keeps his vast collection of over 150 gins – as you create your own G&T and earn your Safari Certificate. " Embark upon a sensory journey around the world, sampling flavours inspired by five of the seven continents, before choosing your final destination. Begin by trying a selection of miniature libations, rich with the flavours of their corresponding continents. Each taster will be introduced by one of our libation cryptographers through a vocal narrative. The chosen spirit’s fascinating origins will be unveiled with compelling tales dating back over six thousand years. 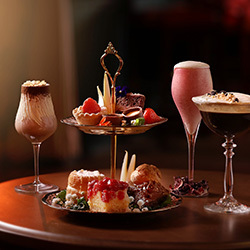 Meanwhile, indulge in expertly paired sweet or savoury bites to complement each tipple and similarly reflect the region's flavours. Then, choose your favourite and enjoy a teapot of your preferred destination as you sit back, make merry and reflect on your global travels. 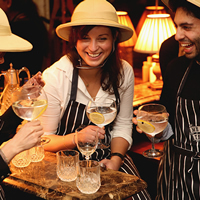 "Mr Fogg’s Gin Parlour’s Gin Safari experience is ready to set sail every Tuesday from 7pm. 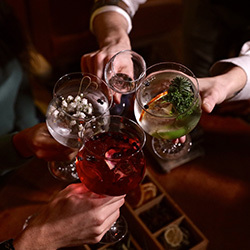 Enjoy a welcome G&T, followed by four gin tasters as you and your fellow hunters enjoy one and a half hours of expert tuition – covering gin, botanicals and tonics – and become masters of mother’s ruin. 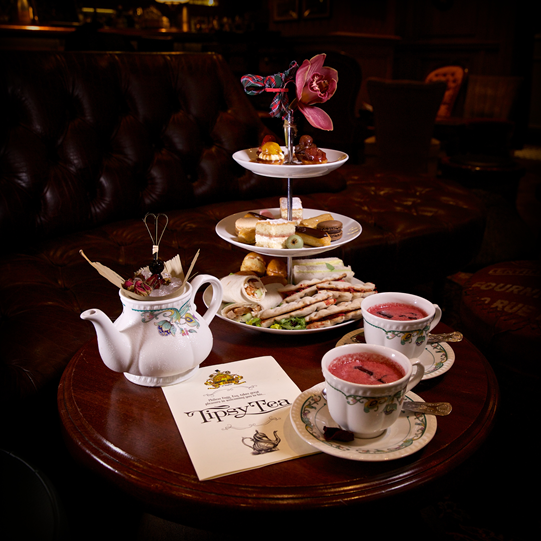 Then, have the chance to hand pick a gin of your choice from The Gin Room – where Mr Fogg keeps his vast collection of over 150 gins – as you create your own G&T and earn your Safari Certificate. For those of you who fancy a nibble during your adventures, upgrade your Safari to include tasty treats such as, cured meats, cheeses, olives and goat’s cheese croquettes. Head below deck for Mrs Fogg's Gin Adventure. Sneaking past the upper-class gentry on Mrs Fogg’s Victorian steamship, you’ll be led by a team of stowaways to the Engine Room, which has been fashioned into a highly illicit gin distillery. 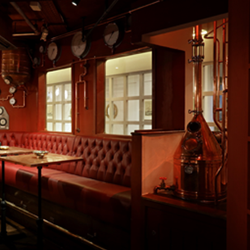 After a welcome cocktail and an introduction to gin production from the grumpy Engine Master, you’ll work together to earn your safe passage aboard the ship, tasked to produce your own gin using the Engine Room's distillery. With different flavours and botanicals, you’ll create a unique batch of hooch. Test its quality in a G&T, before taking home a personalised 200ml bottle of gin – an evocative reminder of life below deck. If you have a query or special request please call Battersea 020 7095 0360 or Covent Garden 0207 590 3602.